Mr. Johnson founder of the Ken Johnson Group, LLC received his bachelors and masters degrees in Music Education from the University of Northern Colorado and most of a doctorate in choral conducting from the University of Missouri at Kansas City. He has taught in the public schools of Bayard, Nebraska and Cheyenne, Wyoming, and has taught in the music departments of Hastings College, The University of Colorado at Denver and currently teaches in the Teacher Education Program at Denver University. At both Bayard and Cheyenne Ken directed vocal ensembles and staged and directed the musical theater. His church experience for the first seventeen years of his life was in the Church of the Nazarene. After marriage he joined a United Presbyterian Church where his wife attended. At that time Ken and his wife Shirley started a children’s choir before he headed off to college. While attending college he was the music director at a Missouri Synod Lutheran Church in Loveland, Colorado, an eye opening experience for a young man raised in the Church of the Nazarene. The wine for communion was quite different, not something that would cause him to leave but something that helped him become more understanding of other denominations. After Graduation in the summer of 1965, he and his family moved to Bayard, Nebraska where he directed the choir at the First Presbyterian Church and filled the pulpit for the pastor at Bayard and McGrew when he was out of town. In 1967 Ken took his family to a new teaching position in Cheyenne, Wyoming where he became the music director at The First Congregational Church. First Congregational was an independent congregational church which was loosely affiliated with a number of other Congregational Churches around the country. This was where he received his first experience with “in the rut” congregation members. He and the pastor helped bring them out of the rut they had been in for over twenty five years. He introduced contemporary music, guitars and many other new and exciting dimensions to the worship service while the pastor fended off the nay-sayers who wanted Ken fired. After 7 years (1967-1974) the Johnson family wended their way to Kansas City to work on a doctorate in choral conducting. He took a position as Music Director at the Country Club Congregational Church where within the first few weeks the pastor asked the Music Committee to fire him because he had the youth choir sing a song with the word Jesus in it. Instead the music committee asked Ken to stay and the pastor left. The pastor never really did explain why he didn’t allow the word Jesus. The next stop was Faith Presbyterian Church in Aurora, Colorado. There is no question that this was the most exciting ministry that he has been involved in. This was a church that was a mega-church before the advent of the mega church. This church eventually grew to more than 4000 members and started or helped start three other churches which have grown to mega church size over the years. While at Faith Ken lead the growth of the music and drama program to major proportions. When he began the adult choir totaled 35 people and the children’s choir numbered 12 from kindergarten to twelfth grade. In a short period of time the adult choir numbered over 100 and the children’s choir had over 200 in a graded choir program. Other programs he started were three handbell choirs, a middle school/high school choir, a recorder ensemble and a 35 piece orchestra made up of church members. He also started a contemporary Christian concert series which included eight concerts per year and a classical concert series with eight concerts a year. Another important aspect of the Faith program was beginning a full drama program which presented three plays and one musical each year and performed drama within the services. Faith was the thorn in the side of the United Presbyterians because they were growing and that growth came from giving the people what they wanted and requiring them to be in ministry if they were a member of the church. Consequently, in the 80’s Faith left the United Presbyterian denomination and helped begin the Evangelical Presbyterian denomination. While at Faith Ken organized and ran the music section of the Mountain Area Sunday School Convention (now named The Christian Ministries Convention) in Denver for two years. After leaving Faith at the end of 1984, Ken began a publishing company, Son-Key, Inc., publishing school and church choral music. The publishing company added a Contemporary Christian Booking and Management Agency, booking and managing a number of singers, actors and speakers. They also helped develop a music software package called HB Music Engraver. At the same time Ken was running this company he was the interim music director at Mission Hills Baptist Church (now called Mission Hills Church) a General Conference Baptist Church. He coordinated that program for one year while they searched for a fulltime director. While at Mission Hills he commissioned a Broadway style Christmas musical Joseph’s Son written by Bil Rodgers and Ken Cooper. Johnson staged and directed the premier performances of the production. You can find more information about Joseph’s Son at www.encoreplay.com/encoreplay/Musical%20pages/josephsson.html. When Mission Hills found a permanent director Johnson went to Grace Chapel an Independent Bible church. There he oversaw the music program directing the choir and began a praise team. When the church decided to discontinue the choir Johnson left and became the part-time Minister of Music at First Baptist of Denver. While at Grace Chapel Ken had the distinct honor to be the co-chair of the organizing committee for the 1987 Colorado Billy Graham Crusade choir. The choir totaled slightly more than 8000 people. Ken organized and coordinated a team of thirty-plus people to make this choir an exciting opportunity for everyone who joined. He also did some new and creative things that had never been done at a crusade before. First Baptist, an American Baptist Church, was a church in turmoil. They had gone through three Directors of Music in the last three years, and the pastor who had been there for three years was at the end of his rope. Two of those Director’s had left because they didn’t want to do any contemporary music and the third left because her spouse was transferred out of town. As the Minister of Music Johnson began using all styles of music and began putting some life into the service which was exactly what the church needed to attract new members. But for a small group of people who were causing problems this was the wrong thing to do. They had made up their mind’s that the church needed to stay the way it had been for years and they would do whatever it took to keep the church the same. They said they would do whatever it took, including taking the leadership to court, to win their church back, and eventually they did just that. Within the first year Ken became the business manager as well as the Minister of Music, taking the church from the brink of bankruptcy to financial health. During his years at First he worked with dissident congregation members to create harmony, and worked closely with an attorney to settle a frivolous legal dispute. The church owned four properties that he managed: the church facility; the building of a church that had merged with First; a church camp in the mountains; and a senior high rise. During his tenure they were able to sell two of the facilities and put the money in the foundation. The church also ran a men’s homeless shelter in the basement. When he became the business manager the shelter was open nine months a year and was literally just a warehouse for sixty men. Over a short period of time he was able to open the shelter twelve months a year; increase the number of men to 120 per night; and began a program to help the men that were able and wanted to work themselves out of homelessness to find jobs, and eventually move into apartments. Ten years to the day Johnson left First Baptist to begin a ministry at St. James Presbyterian Church, a PCUSA church. For many years St. James had been one of the stellar performing churches in the Denver Presbytery but had recently fallen on hard times. Over a period of ten years they had gone from a church of over 1350 members to under 700 members. This was an interesting assignment that he still believes God Called him to, but it certainly didn’t work out the way he wanted. He left St. James in 2002 feeling a call to help churches that were struggling to find enough members and money to keep their doors open. Ken has been an active member of the American Choral Directors Association since 1965 serving as president of the Wyoming and Colorado associations and President Elect of the Nebraska association. He has also been a member of the Music Educators National Conference and the American Guild of Organists. For eleven years during the 1990’s and into the 2000’s he directed The Aurora Singers a pop non-profit community singing group. During that time the Singers performed more than fifty concerts and four full musical productions. In 1999 the group toured New Zealand for two weeks. 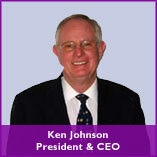 Ken has consulted with a number of churches during a ministerial career that spans over 40 years. He has written a number of articles that are currently being published and is also in negotiations with publishers for a book on the arts in the church entitled Production and Performance in Worship—or what can the Arts Department do to liven up this church? Ken has completed the church consultant training with Thom Rainer at Church Central in Louisville, Kentucky and is a Certified Church Consultant, he has also participated in church consultant training with Bill Easum of Easum-Bandy in Port Aransas,Texas.